Our Two Tank System for whole house water filtration and conditioning! 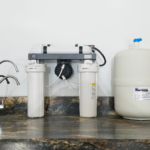 Our waters softeners will work for you in ensuring that your entire house receives the benefits of soft, clean water. Manual filter valves provide the ability to manually backwash and rinse a carbon bed without electricity. Reverse osmosis drinking water systems are the most advanced technology for drinking water quality improvement. Laundry Pro is better for your laundry, better for your family and better for the environment…and it will help you save money too.